Sagar Public School (SPS) Bhopal started its journey in the year 2001 with its first branch of school at Saket Nagar, second branch of school at Gandhi Nagar, in the year 2005, third branch of school at Rohit Nagar in the year 2014 and the fourth branch of school at Ratibad in the year 2017. Over the last 18 Years SPS has marked tremendous growth in leaps and bounces as one of the most sought after prestigious educational institution not only in Bhopal but in entire M.P. Sagar Public School, Rohit Nagar is CBSE affiliated (Affiliation number: 1030852), co-educational Day Boarding School, one of its own kind in the entire city of Bhopal which is committed to excellence. The school is situated away from the hustle and bustle of the city, spread across in the area of 14736 square meter. In this age of rapid technological advancement, it is imperative that we keep ourselves abreast of the changes around us, cognizant of this need, our classes are equipped with Tata class edge. We provide web based learning programmes to the children which serves the purpose of converting learning into fun activity making it interesting along with hands-on experience for effective learning. With a team of devoted, sincere and experienced team of educators, SPS Rohit Nagar has a very vibrant, strong academic atmosphere. SPS has maintained an excellent academic track record for over a decade. Educational practices enhance both the learning and teaching ends of education most effectively. With a vision of quality enhancement and a mission to provide quality education SPS Rohit Nagar facilitates experimental learning through a wide range of activities. A multifaceted and multiple disciplinary approach coupled with innovativeness is offered to students so that each student achieves his/her maximum potential. SPS Rohit Nagar takes proper care of curriculum, thus contributing in developing sportsman-spirit and a healthy and constructive attitude towards life. Our students learn not to be just achievers, but also how to accept failures gracefully and start again. Learning and acquiring skills is rapidly shifting from the four walls of classrooms and school boundaries. Co-scholastic activities not only groom the inherent talent of the child but also give them an extra edge and confidence to move ahead in the competitive world. The school provides ample opportunities to nurture such talents by organizing various events. The school works upon maximizing student’s potential through self development programmes and practices like Yoga, Meditation, Cultural and other Recreational programmes are planned for the academic year with a perspective of providing a platform to the students for exhibiting their innate propensities. Student’s talent and skill is identified by teachers and supported by parents to bring out the best they are capable of. The additional hour is optimally utilized for the development of hobbies, expert sports coaching and extra academic help. Thus, the family is able to spend quality time at home. At SPS Rohit Nagar, the Skill Enrichment Classes (SEC) are designed systematically so that Sagarites can perform and excel in vocational courses also. Skill Enrichment Classes are categorized into three segments: Sports, Aesthetic and Literary. The school is well-equipped with ultra-modern technology including air conditioned, fully sound proof auditorium and premises with CCTV cameras installed. We have a rich library which provides the serenity to the students to dive deep into the ocean of knowledge. The school also has well equipped Computer, language, Science and Maths Labs. We have a first aid centre, that is, infirmary where, if a child is unwell, can take rest and is taken care of. With a range of extra- curricular pursuits, we aim at shaping children into well-rounded, socially active global citizens. Students are taught various forms of dance and music by a team of talented and efficient teachers. Sports and physical exercises are vital to all for a sound health, mind and body. 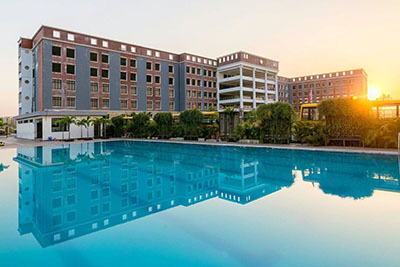 Hence, the school also provides the facility to learn various indoor as well as outdoor games and sports such as badminton, squash, table tennis, skating, football, basketball and many more. We have a mini Olympic size swimming pool too. The infrastructure of the building has been barrier free including ramps, keeping in mind all the safety measures for students and others. Parents are partners in education Goal and ambitions of school and parents are synchronized. We assure our continued commitment in excellence and perseverance in reaching our coveted goal of success and maintaining the grandeur of the school!